Whether you plan on transporting plenty of passengers, towing large loads, trekking off road, or some combination of the three, there’s surely an option for you among the new lineup of Toyota crossovers and SUVs. Drivers all throughout the Palm Beaches can find out which Toyota crossover or SUV will best suit their driving needs with the help of this guide. Once you’ve had a chance to read up on your options, visit Earl Stewart Toyota for a test drive of your favorite models. 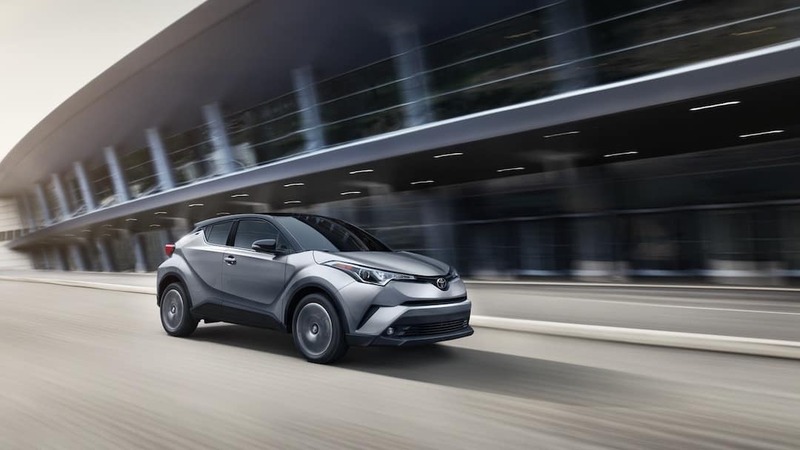 The 2018 Toyota C-HR is a subcompact crossover SUV that gives you the utility and features many Jupiter shoppers are looking for at a reasonable MSRP from just $20,995*. Getting up to an EPA-estimated 31 mpg highway, this small crossover comes standard with dynamic 17-inch alloy wheels and a rear spoiler on the outside, as well as an 8-inch touchscreen and Toyota Safety Sense™ P (TSS-P) for extra safety. While it’s compact enough to comfortably navigate the streets of West Palm Beach with ease, it still gets you seating for five and a max cargo area of 36.4 cubic feet. 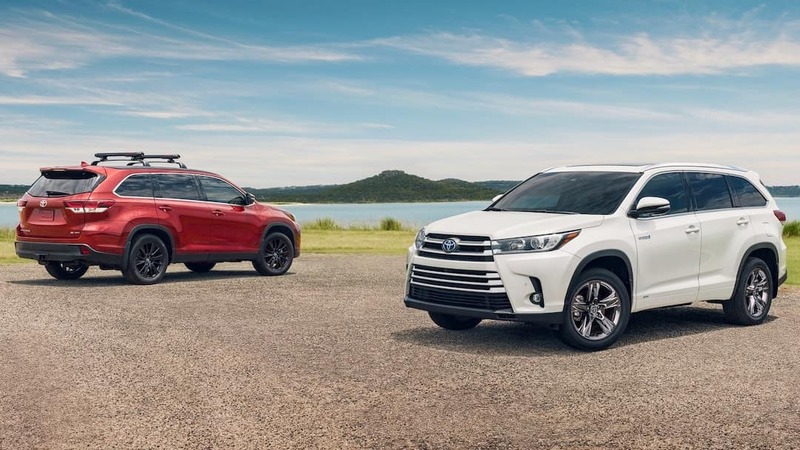 The all-new 2019 Toyota RAV4 returns as one of the most well-rounded options in the compact crossover SUV segment. Guaranteeing more room than much of the competition, the RAV4 has more than enough space for five adults plus a max cargo area of 69.8 cubic feet. Available with your choice of front-wheel or all-wheel drive, the RAV4 is also able to get up to an EPA-estimated 35 mpg highway. This year’s model also returns with the standard Toyota Safety Sense™ 2.0 (TSS 2.0) package, which includes features like a Pre-Collision System with Pedestrian Detection, Lane Departure Alert with Steering Assist, and Automatic High Beams. 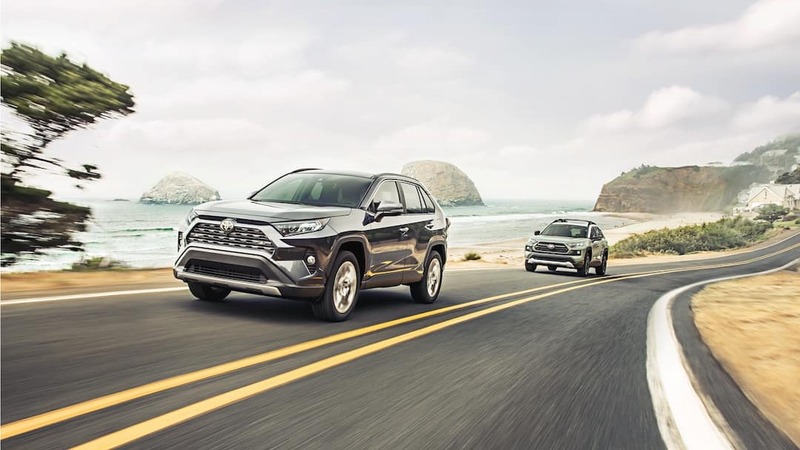 For those who need even more room for passengers, the 2019 Toyota Highlander is a great option thanks to its three rows of seating for up to eight passengers. This mid-size crossover SUV returns with a number of updates this year, beginning with a choice between a 2.7L 4-Cylinder engine or a 3.5L V6 engine. Paired with either a 6-speed or an 8-speed automatic transmission and auto stop/start features, the new Highlander also enjoys up to 27 mpg highway in fuel economy. Other new features include an SE trim with more aggressive suspension and steering, as well as an aggressive front grille and standard TSS-P. Premium features like a rear-seat entertainment system, panoramic moonroof, and Entune™ Premium JBL Audio are also available. This full-size, body-on-frame SUV handles serious off-road activities without blinking an eye. 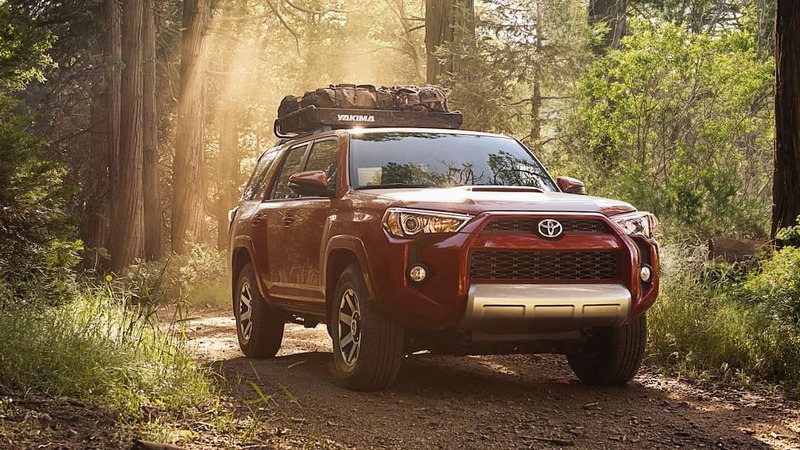 In fact, the 2019 Toyota 4Runner treks on rough terrain better than just about any model in this segment! Equipped with a standard 4.0L V6 engine, the Toyota 4Runner can tow up to 5,000 pounds when properly equipped and is offered with rear-wheel and four-wheel drive setups, as well as premium off-road features like a Kinetic Dynamic Suspension System (KDSS) and locking rear differential with Multi-terrain Select and Crawl Control (CRAWL). The standard seating arrangement in the 4Runner provides two rows for up to five passengers, but you can also opt for a third-row to increase seating to seven. When you’re looking to haul even more gear inside the cabin, the cargo area opens up to reveal a max volume of up to 89.7 cubic feet. Behind the second row, you’ll have up to 47.2 cubic feet of cargo room standard. 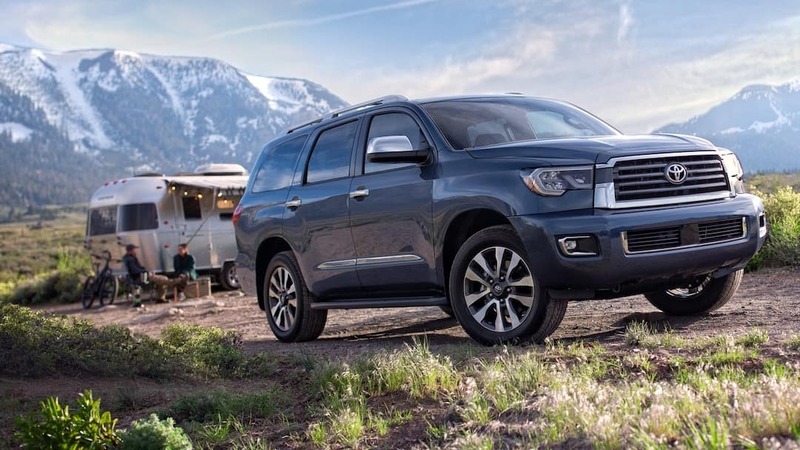 With standard seating for eight, the 2019 Toyota Sequoia allows you to easily tote the whole family around while still gaining the benefits of a serious off-road performer. Those who want more comfortable second-row seating for adults can opt for second-row captain’s chairs, which reduces the seating capacity to seven. You’ll also find standard features like the Entune™ Audio Plus infotainment system and a Blind Spot Monitoring System. At the heart of the Sequoia is a 5.7L V8 engine that pumps out 381 hp and 401 lb-ft of torque. While rear-wheel drive is standard, you can also opt for a four-wheel drive system with a locking limited-slip center differential and a low-range gearing system. The Sequoia can tow up to 7,400 pounds. For those who want to add sumptuous luxury to their full-size, off-road ready SUV, the 2019 Toyota Land Cruiser is in a class all its own. 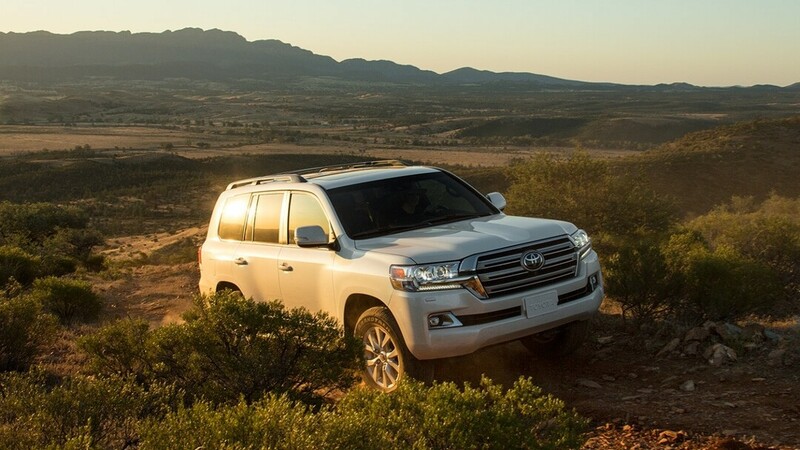 Available in one immaculately equipped trim level, the Land Cruiser sports premium leather and wood trim on the steering wheel, perforated leather upholstery, four-zone climate control, and a cooling box in the center console. Every model comes with a Kinetic Dynamic Suspension System, five-speed Crawl Control, Hill-Start Assist, and other features designed to give the Land Cruiser maximum off-road prowess. The 5.7L V8 engine comes with an eight-speed automatic transmission and standard full-time four-wheel drive. It can tow up to 8,100 pounds. There are a lot of exciting and versatile Toyota crossovers and SUVs available to drivers throughout the Palm Beaches, and you’ll find them all near Stuart at Earl Stewart Toyota, located at 1215 US-1 in Lake Park, FL. Remember that, when you shop with us, you’ll enjoy no dealer fees as well as a variety of additional unique advantages, including a 3-day unconditional money back guarantee and a straightforward 1Price policy on all models. Whether you’re looking for a people-hauler, an off-road trekker, or something in between, we’ve got what you’re looking for at our dealership. Stop in and chat with our sales team any day of the week, or get in touch to set up a test drive! Disclaimers: *Manufacturer’s Suggested Retail Price, excludes the Delivery, Processing and Handling Fee of $865 for Cars, $940 for Small/Light Trucks (Sienna, RAV4, Highlander Gas, Highlander HV, 4Runner, Tacoma and Venza), $1195 for Large Trucks (Tundra), and $1095 for Large SUVs (Sequoia and Land Cruiser). (Historically, vehicle manufacturers and distributors have charged a separate fee for processing, handling and delivering vehicles to dealerships. Toyota’s charge for these services is called the “Delivery, Processing and Handling Fee” and is based on the value of the processing, handling and delivery services Toyota provides as well as Toyota’s overall pricing structure. Toyota may make a profit on the Delivery, Processing and Handling Fee.) Excludes taxes, license, title and available or regionally required equipment. Actual dealer price will vary. Actual dealer document fee may vary.